Is Trump Getting Played by North Korea?Kim Jong-un’s hot-and-cold behavior is messing with the administration’s already disjointed strategy for the upcoming talks. North Korea Cancels Talks With South Over Military ExercisesA reminder that Kim Jong-un isn’t a traditional negotiating partner. North Korea Appears to Be Shutting Down Its Nuke-Testing SiteBut we’ve been here before, and there’s a long way to go before Pyongyang’s nuclear program is closed. North Korea Summit to Hinge on Whether Trump Likes Cut of Kim’s JibReally, why bother with diplomacy? 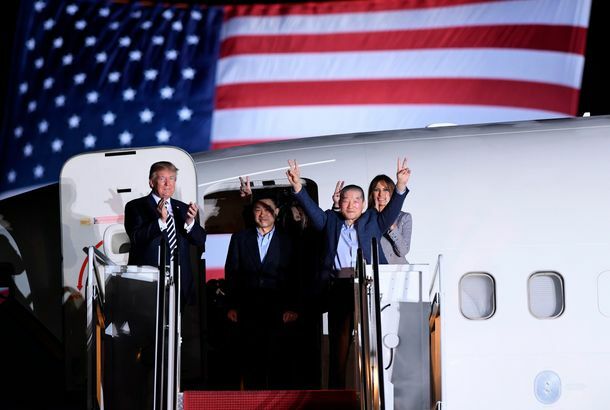 Trump Greets 3 Americans Freed by North KoreaHe met Kim Hak-song, Tony Kim, and Kim Dong-chul when they landed in Maryland, and said Kim Jong-un was “really was excellent” to them. Pompeo Is Returning From North Korea With U.S. CaptivesKim Hak-song, Tony Kim, and Kim Dong-chul have been freed. Now the President of South Korea Thinks Trump Should Get a Nobel Peace PrizeAppealing to Trump’s ego is a time-honored strategy that South Korea seems to have mastered. 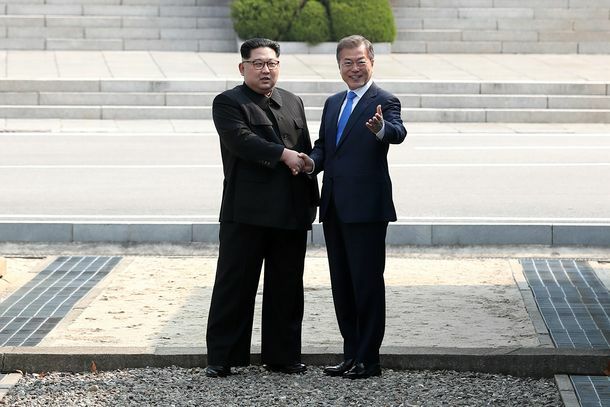 Did Peace Just Break Out Between North and South Korea?Kim Jong-un and Moon Jae-in have taken a step toward a new future for their respective countries. But will they take a step back? The Campaign for Donald Trump’s Nobel Peace Prize Has BegunHis biggest boosters, and even a few others, say Trump deserves the award for developments on the Korean peninsula. South Korea Stops Blaring K-pop at North Korean BorderBad news for North Koreans who enjoy BtoB and live near the DMZ. North Korea Announces Indefinite Suspension of Nuclear ProgramThe dramatic move comes ahead of a planned meeting between President Trump and Kim Jong-un. Trump Says U.S. and North Korea Have Already Begun TalksAt least a month before the main event, a sit-down between the president and Kim Jong Un. 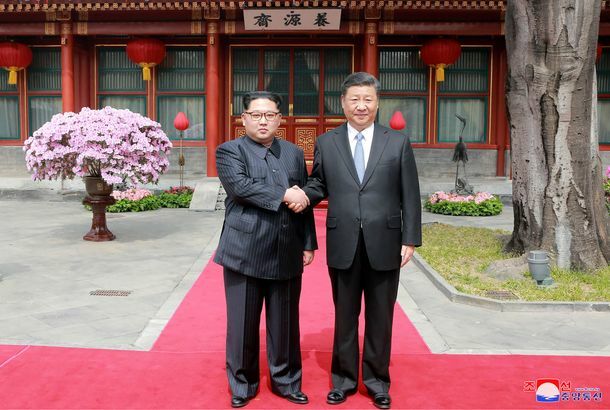 With Kim Jong-un Meeting, China Tells the U.S. It Won’t Be IgnoredXi Jinping threw off summit calculations, and the U.S. must respond with patience and diplomatic skill. Too bad Trump’s team possesses the opposite. 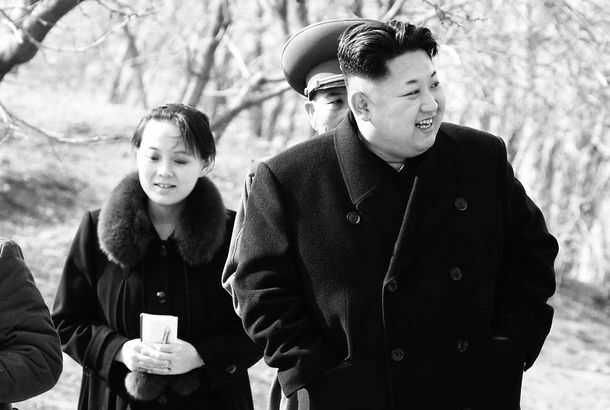 How the U.S. and North Korea Are Preparing for the Trump-Kim SummitAs Trump undercuts the effort with hawkish hires, Kim is making diplomatic overtures to his neighbors — and starting up a new nuclear reactor. Senators Worry Trump Will Get Played by Kim Jong-unEven supporters of the president are worried that he doesn’t quite know what he’s doing. Dennis Rodman Is Happy His Pals Trump and Kim Plan to MeetScore one for basketball diplomacy. 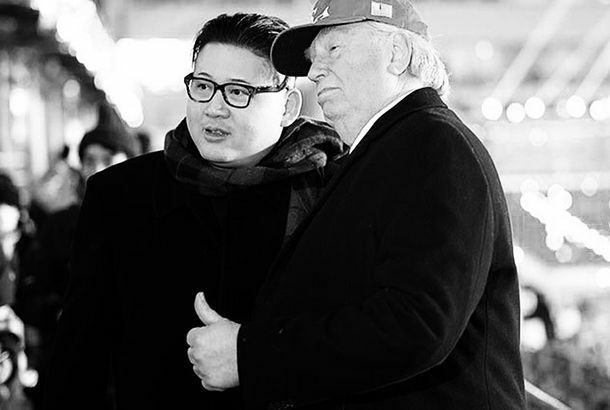 Trump and Kim Jong-un to MeetIt’s unclear if there’s been a real breakthrough, or it’s just another move in a long, frustrating chess game. 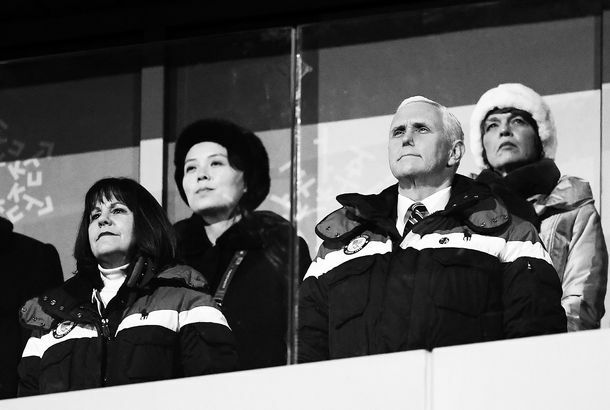 Realistic Donald Trump and Kim Jong-un Impersonators Infiltrated the OlympicsThey were kicked out of the Opening Ceremony. Why Trump Thinks Kim Jong-un, Who Called Him a ‘Dotard,’ Might Be His FriendEither he’s been secretly talking with Rocket Man, or he just has faith in his ability to charm the dictator. Trump Team Mulls Giving North Korea ‘Bloody Nose,’ Betting Kim Won’t RetaliateTop officials are reportedly considering whether the U.S. could launch a limited strike on Kim Jong-un’s regime without starting a war. North Korea Reopens Hotline to South: Breakthrough or Another Ploy?Reestablishing communication could help ease tensions, or drive a wedge between the U.S. and South Korea. Dennis Rodman Is Trying to Unite the U.S. and North Korea With Ugly SweatersProceeds go toward wounded veterans. 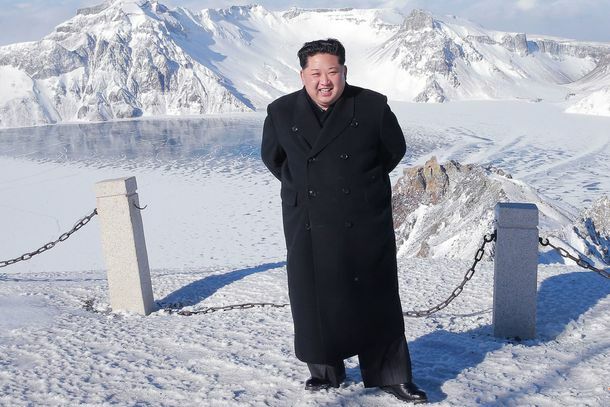 Kim Jong-un’s Shoes Sure Are Shiny for Someone Who Just ‘Climbed’ a MountainNorth Korean state media claims he climbed a 8,500-foot mountain in snowy conditions. North Korea May Also Be Developing Submarine Missiles and Biological WeaponsNew reports highlight that nuclear weapons are just one of several threats posed by Kim Jong-un’s regime. North Korea Fires First Missile Since SeptemberIt’s probably just a matter of time before President Trump replies with an ill-considered threat. Is Labeling North Korea a State Sponsor of Terrorism Just Another Trump Insult?North Korea has a rich history of sponsoring terrorism, but not so much lately. Trump Tweets Awesome Video of Him Being Totally AwesomeWhat fresh hell is this? In South Korea, Trump Warns the North: ‘Don’t Try Us’After previously appearing to write it off, Trump also suggested diplomacy to solve tensions with Pyongyang. 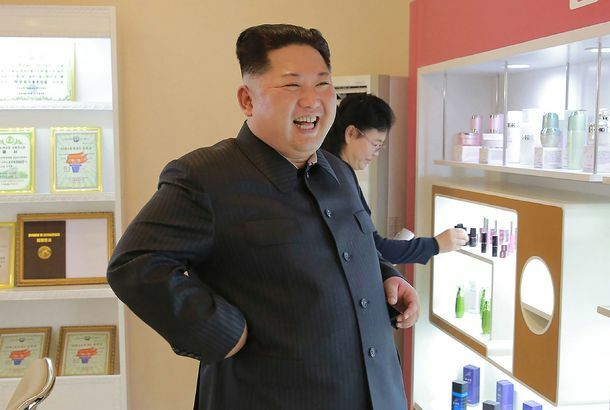 Here’s North Korean Dictator Kim Jong-un Touring a Cosmetics FactoryA fun day for the supreme leader. What It Takes to Get Accepted Into an Elite Apocalypse BunkerIt’s boom times for the bomb-shelter business in Silicon Valley. But you better be able to write a good application essay. Wait, Are We at War With North Korea Now?Kim Jong Un’s foreign minister said so in no uncertain terms. What now? The Vaping Congressman Pushes for ‘Preemptive Strike’ on North KoreaMeanwhile, Kim Jong-un and President Trump trade insults. Trump Calls Kim Jong-un ‘Rocket Man’ in Most Presidential Tweets YetThese are the new fireside chats.